Environmental regulations are something many find complicated and difficult. The fines for non-compliance can reach the multi-million dollar levels and being, correctly informed and continuously updated of the applicable regulation is more crucial than ever. Marinfloc has developed a GPS based system that gives the bridge a live feed of the applicable regulation in the current position- The Enviropilot. Many of the Marpol regulations concerning discharge of various waste streams from a vessel ( I.E. garbage, air emissions, bilge water, black and grey water, food waste and more) are connected to nautical distances from nearest land (3,12,25,50,200 nautical miles). The regulations are also geographically connected to special areas such as the Baltic Sea, North Sea, Caribbean Sea, Red Sea, Antarctica etc. where special regulations may apply, but that can differ between the special areas. There are moreover ECA areas (Emission Control Areas), in Europe and in the United States, where low sulphur fuel must be used unless the vessel is equipped with exhaust gas treatment which very few vessels are to date and there is since January 1st last year the EU’s requirement of 0,1% sulphur content in fuel burnt while ships are berthed. Navigating the Marpol 73/78 is tricky and an even bigger headache, when speaking to sea farers, are the national regulations that is some countries can go down to state level. Looking into the discharge of bilge water as an example, the Marpol regulation states that the vessel must discharge the bilge water through an approved oil filtering equipment, that the effluent is below 15 PPM (Parts Per Million), that the vessel is “en route” and that there is not mixed with any oil cargo residues nor originate from cargo room bilges. There is no 12 nautical mile requirement and bilge water is allowed to be discharged in all the special areas apart from Antarctica. So far so good but just looking into the national regulations in the Nordic countries the matter becomes more complex. In Sweden and Norway there is no specific national regulation for bilge water discharge other than the Marpol requirement so a vessel is allowed discharge all the way into port as long as the criteria stated above are fulfilled. However in the neighboring country of Denmark there is a national regulation of 12 nautical miles for bilge water discharge so it is vital to know if you are in Swedish or Danish waters when passing through the straight of Oresund. The two remaining Nordic countries of Finland and Island have their own limits – Finland has a 4nm limit for bilge water discharge so the legislation is far from uniform and this is just one example of one waste stream in a few countries in northern Europe. The United States has a quite extensive environmental national regulations and each individual state also have their own regulations in many cases. The national rules are being uploaded to the system country by country and the latest is USA where also the state regulations are included. When speaking of distances from nearest land it is not the distance from the nearest island, reef or land mass as one would expect from just the phrase. The IMO definition of “nearest land” is defined as the distance from the base line defining the territorial waters of a country. The base line is a line connecting the defined base line points which are the most remote shoreline or island points at low tide. Some countries that consist of many islands, or have an archipelago of islands like for instance Greece, Bahamas and Finland have an archipelagic baseline. This means that the base line is surrounding the archipelago instead of having separate base lines surrounding every island. This practically means that a vessel can be inside the 3 nautical mile line from a regulatory point of view even though it may be geographically far from nearest island or landmass. On the opposite some islands are excluded from the base points and should hence be disregarded from a regulatory point of view. The Swedish island of Gotska Sandön is one example of an island excluded from the baseline. This island has been a national park since 1909 and is moreover situated in the special area -Baltic sea, but as it is being excluded from the baseline system a vessel can discharge untreated sewage right next to it which would be very bad for the environment but not any violation how strange as it may seem. It is the captain’s responsibility to keep track of all the various regulations in different areas that apply and also to the various nautical limits that are connected to them. In some areas the fines for illegal discharges can be tremendous and also impose imprisonment for crewmembers. Marinfloc has together with our partner Marine position AB developed the Enviropilot which is a GPS based system that has been developed to assist the crew by giving live guidance of the applicable regulations on a separate screen. The system is mounted on the Bridge and connected to the vessels GPS and consists of one screen integrated control unit which gives the captain a live feed on the screen of the applicable regulation in the vessels position for the various Marpol annexes such as bilge water, sewage, grey water, garbage, food waste, cargo (oil in slop tank through the ODME), ballast water exchange, incinerator and sulfur emissions. The information for the applicable regulation for each waste stream is presented so the captain gets a full overview of what can be discharged in the current position. This has been made possible by electronically defining the 3, 12, 25, 50 & 200 nautical mile line all over the world together with the special areas and ECA (emission control areas) and particularly sensitive sea areas (PSSA’s) in a vectored format. The lines and areas are displayed on the screen and the captain will be given notice 20 nautical miles prior to crossing a line, at given course and speed, that a more/less stringent regulation will apply to enable planning and safe margins. In the cases of disputed areas between countries, where the territorial claims, and hence the baselines, are different the system lets the most conservative territorial baseline claim from both countries prevail and will also be displayed in the system. To assist the crew further and to prevent mistakes the Enviropilot is equipped with relay outputs that are triggered at various distances from nearest land and that can be used for indication lights in the garbage room, next to the incinerator or oily water separator, sewage treatment plant etc. A green and red light next to the equipment will indicate if the it can be operated or not. The captain can always override the relay outputs with a key breaker as the Enviropilot is a guidance only. Bilge water and sludge discharge is by far the waste stream that has resulted in most prosecutions and the fines often reach the million dollar range. To avoid the human factor the Enviropilot can be connected to a Whitebox so that the Whitebox three-way valve will close when the vessel crosses the 12 nautical mile line anywhere in the world. Even though there is not 12 nautical mile IMO requirement for bilge water discharge it is a more or less a policy most shipping companies has implemented. If the captain wants to allow discharge within the 12 nautical mile line he or she can disable relay output and consequently the 12 nautical mile interlock. The Whitebox is a control and monitoring system for bilge water discharge. It contains all vital equipment concerning the discharge of treated bilge water such as an oil content meter, three-way valve, flow meter, flow switch etc. all installed in a locked cage to which the Chief engineer has the key. Signals from the Whitebox of the oil content, valve positions, flow through the oil content meter, flow overboard, door position etc. is recorded together with the vessel position and time in a digital recorder installed in the engine control room. This enables Chief engineer full control of the overboard discharge with the oily water separator as the Whitebox is tamper proof as long as it is locked. The main purpose of the Whitebox is however to protect the crew and ship-owner as it provides the evidence that the operations has been complaint and with no tampering of the equipment. Tampering of oily water separators or the use of by-passes, so called magic pipes, is unfortunately still a very common occurrence and the number of prosecutions and heavy fines remain at a high level inspire of the enhanced environmental awareness. Whistle blowers are rewarded with big numbers when reporting and the need to secure the evidence is vital. Dilution of the sample or a shut sample valve is the by far most common method to trick the oil content meter. 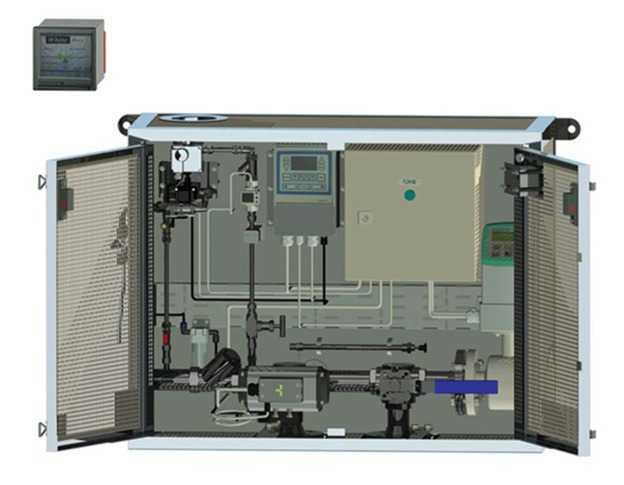 However all modern oil content meters are logging the oil content, alarms and running status of the oily water separator which surprisingly many engineers are unaware of. The loggers does not however provide information if there is a flow through the oil content meter and if an inspector finds discrepancies between the entries in the oil record book and the oil content meter log it can be regarded as falsified statements and if the crew tries to cover up any illegal activities it will be regarded as obstruction of justice and tampering of evidence which will add up to the penalty. A record of straight 0 PPM in the logger is a red flag that indicates a that there has not been a sample flow through the oil content meter. A port state control officer can instruct the crew to operate the OWS and a history of straight 0 PPM will be hard to explain if the oil content meter does not show 0 at the inspection where there must be a flow through the oil content meter. If a vessel is equipped with an Enviropilot integrated with a Whitebox the bridge will also get all the Whitebox information on the Enviropilot screen which is beneficial as the captain signs the oil record book and can cross check with the Whitebox history that the entries are correct. Many companies have a more stringent company policy for discharge of the various waste streams than the IMO requirements. Some shipping companies has a zero discharge policy within 12 nautical miles or 25 nautical policy for bilge water discharge or a policy of zero discharge in US waters. There is a big variation from company to company but the system can be tailor made by integrating a more stringent company policy than the IMO regulations if applicable and desirable to safeguard the implementation of the company policy. To date the system includes the Marpol regulations and a worldwide coverage of the applicable distances from nearest land and the process to include the national and regional legislation down to state level has begun which will be lifting the concept even further. The geographic upgrades, the base lines may change, and the regulatory update interval is on a quarterly basis to ensure that the system has the most recent regulations uploaded and the system. The Enviropilot has a simulator feature in which the user can simulate a position to verify the applicable regulations in that point to assist in the planning of the route. Future upgrades are, apart from the national regulation implementation, also to add a logging function to the system of the discharge of the various waste streams with reports displaying the various discharges on a chart. The Enviropilot is a new invention and a simplified approach to a topic many find complicated and difficult and it was recently awarded the Seatrade award in the clean shipping category this year.